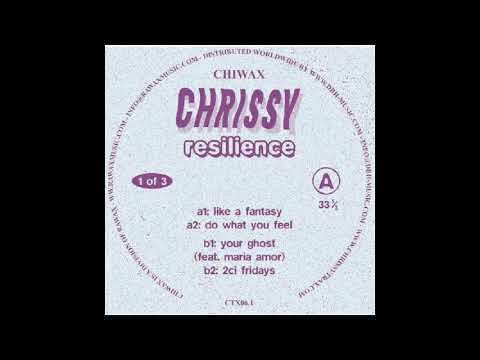 A new Chrissy record is about to drop on the RAWAX label off shoot CHIWAX, titled “Resilience”. The 14 track all killer no filler album was inspired by Chrissy’s love for early 90s rave records. The album encompasses many of the early 90s rave genres such as break-beat, acid house and jungle. The album is bursting with uplifting piano riffs , euphoric vocals and chugging house bass lines. Today we have the pleasure of premiering the first track on the album titled Like a Fantasy. After the first few rave chord stabs you are instantly thrown into a hedonistic warehouse, head rushing and smiling widely. The vocal rings out the title of the track whilst choppy break-beat drums filter in and get you moving. The kick drum slams in and you are up and away. It does not take long for that famous TB303 acid bassline lick to join the mix, incredible how such a small synthesizer has the power to put a smile on the faces of party people all over the world. The track could be summed up with a yellow smiley face, the illustration of defiance, positivity and rave. This track is contagious and will be unstoppable on a dance floor. Total brilliance from Chrissy on this one – a huge tip for any DJ looking to lift a set with energy, euphoria and 90s rave nostalgia. Get your copy here.